A lot of mysteries surround the Crystal Skulls. Especially the Mitchell-Hedges Skull became famous in the 1990s as the question was brought forward on how the ancient people could work with something as hard as quartz in order to fabricate the skulls, as they had no tools that could cut or polish them. In short, the skulls didn't fit in the archeological views. Three of the four of the big skulls are in museums, while the most famous - the afore mentioned Mitchell-Hegdes Skull is in a private collection. One is in the British Museum, another resides in a museum in Paris and the Third is in the Smithonian Collection in Washington DC, USA. 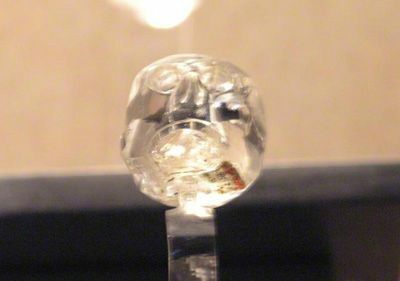 In 1990 an excellent and thorough video documentary was made about the Mitchell-Hedges Skull called "The Crystal Skull of Lubantuun". After this documentary two different groups "jumped" on the Crystal Skull bandwagon. On the one side the New Age enthusiasts that blindly believe everything extraordinary and then - of course - the skeptics that think we know everything about everything and there are no mysteries left to explore. In the following article, I would like to show you that the truth might be right in the middle of those two opposing views. In modern views of Archaeological research all of the skulls are modern time fakes dating back to the early years of the 20th century. Case closed. Many of the statements and research is shown on the Wikipedia article, that you can read by clicking this link. But is this really the full story? I always get really nervous if articles, like the Wikipedia one, is very one sided and dismisses everything else. This goes either way, I'm also cautious from all the New Age claims of crystal healing powers and the likes. First we have to establish that the statement made in the Wiki article that under the Microscope one can find fine tool marks (some with metal tools) hence it has to be a modern fake, is a wrong conclusion. The only thing it tells us is that the skull(s) were not made with tools that modern Archaeology says the Ancient people had. But didn't we already know that? Wasn't the claim always that the ancients couldn't have made the skulls, because they didn't have the tools? 1. The Skulls are indeed made in modern times and therefore considered a fake. No more explanation needed. 2. The Skulls are ancient, but not made with the tools the Archaeologist say the Ancient people had. 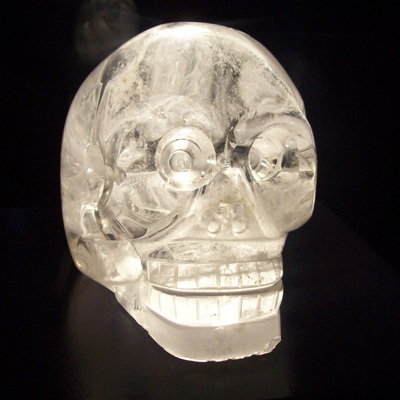 Crystal Skull in the British Museum. If no. 1 is correct, don't we have to ask ourselves why on earth somebody got an idea in the 1900-1930s to manufacture Crystal skulls? I mean one skull would be a cute oddity, but four? Quartz crystal is a material that was never easy to work with. Quartz is one of the hardest materials known to man, exeeded only by Diamond, Rubies (also called Corundum) and Topaz. And why say they are coming from latin America? 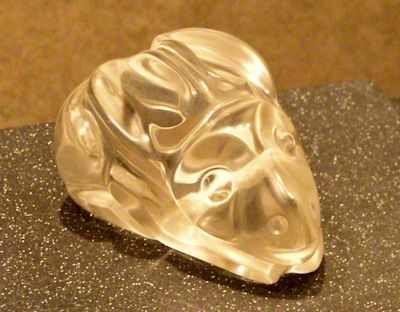 If somebody fakes a crystal skull, wouldn't they have been just as enigmatic if they came out of Africa? Like Egypt, which held just as much mystery. Or the deep jungles of India. China maybe. No, the 'faker's "decided" they came out of Latin America. If no. 2 is correct, the implications would be enormous, not matter how you look at it. It means that the Ancient people in Central America had more tools as the Archaeologists think. It means that they knew other metals other than bronze AND they knew how to work with something as hard as quartz. OR they had help from another source. At any rate, the key question always has been: Did the ancient people in Central America have the ability to work with quartz, or is it all "debunked". During my visits in the various Museums of the world I came across very intersting artifacts that proof - without the shadow of a doubt - that the ancient people in Central America did in fact work with quartz. 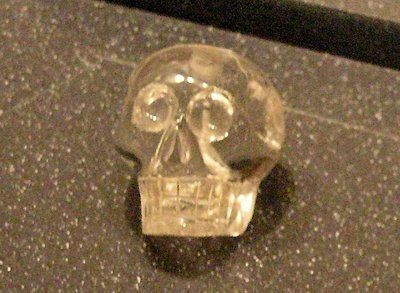 The following artifacts I have never seen in any article, book, magazine or movie that wants to convince everybody that ALL the Crystal skulls are modern fakes. I think this information is deliberately withheld and that's why I would like to present it to you. 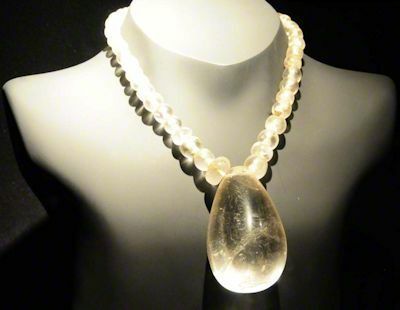 Let's start out with a whole quartz necklace that I photographed in the National Museum of Ecuador in the capital Quito. As you can see the the Necklace is made out of 19 artificially rounded quartz spheres. Each sphere has a hole drilled through the middle in order to thread a string through. Now as I said earlier, this is not a small feat, of you have no diamond drill, since quartz is so hard. Sand you find on a beach is basically rock pulverized by nature over millions of years. This rock also contained quartz and if you look at sand more closely, you can see the tiny quartz pieces. It's the hardness of the quartz that makes sand great a good abbresive. Sandblasting wouldn't work if it wouldn't be for the Quartz in the sand. A whole different set of problems are the holes in the middle of the spheres. Think about it. What do you use to get the hole started and keep going to drill through? The official explanation is a wooden stick with sand thrown in. If you are interested in testing this theory of the official Archaeologists, I urge you to go to your closest rock shop and get yourself some smoke quartz for a few Dollars. Get yourself some sand and a stick and start drilling. I guarantee you to will stop when your hands are getting bloody and you realize that you haven't even scratched the surface of your rock. 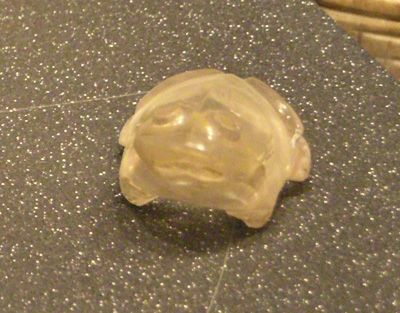 Next up is a little frog made out of smoke quartz, photographed in the Anthropology Museum of Mexico City. This little guy is about 8 centimeters long. No matter how small an artifact is, the hardness of the stone stays always the same. The geometry and detail of the workmanship is absolutely outstanding in every respect and hard to imagine without metal and diamond tools. The intigrate detail around the eyes, the mouth, the feet and back section are so fantastic that it is hard to believe this was carved and polished by hand. The other problem of a material as hard as quartz I have not touched on, yet. The harder a material gets the more briddle it becomes. Every diamond cutter knows that. Every big diamond that is cut is studied for days and weeks before the diamond cutter lays their first hand on it. If the stone is cut or worked against it's "grain" and the natural structure of the stone, it can burst into thousand pieces. Quartz is not different than diamond in this respect. It's natural properties are very similar. This meanse that not only had the artist unbelievable patience in working the frog pictured on the right, but also must have had great knowledge (and experience) working with quartz. It's also very hard to imagine how the artist would have carved out all the integrate detail on the frog with just sand and sticks rubbed on the stone. It's one thing to drill a whole (where the snad and stick method makes at least theoretical sense) but to carve out minute detail with symmetrical precision. 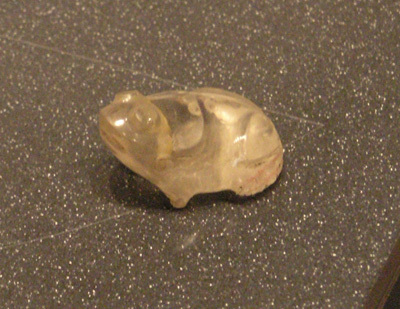 This almost avantgarde looking object made of quartz can also be viewed in the Anthropological museum of Mexico City. It is made with a quality and precision that leaves you breathless. The object is about 15 centimeters long and 10 centimeters high. I'm not quite sure what it depicts. From some angles (lower photo) it looks like a face and from some angles (top photo) it resembles a small animal, like a rabbit of sorts. The most stunning part of the object is the way the surface is finished. It really looks like it was made yesterday. 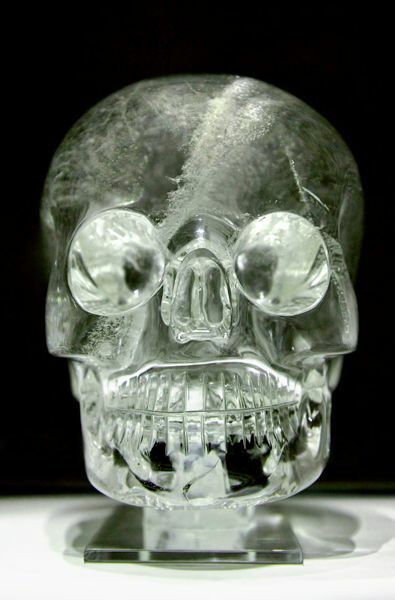 But on to what you are really here for, the Mystery of the Crystal Skulls. The real mystery, not the Indiana Jones one. On the right you see a real, undisputed, guaranteed genuine (even by archaeologists) Crystal skull from ancient Mesoamerica. Again photographed in the Anthropology Museum of Mexico City. I apologize for the slightly blurry images, but those photos are from a few years back. Digital cameras have autofocus problems with Crystal objects (and this is not a conspirace theory :) to begin with and the extreme low light environment doesn't help either. But I think the images show enough detail for the intersted viewer to see what the items are all about. 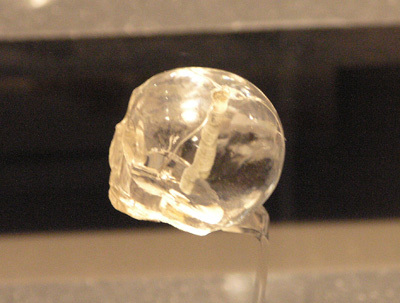 The Mexico City Museum houses a second crystal skull. About 5cm in diameter, this skull has a hole drilled from the top to the bottom. Of course these smaller skulls are less spectacular compared to their bigger counterparts, but they are not less interesting as they show the same intigrate detail as the bigger controversial ones. The authentisity of these smaller skulls is undisputed. The ancient crystal mystery doesn't stop here, though. The ancient people had some indepth knowledge about working with quartz crystal and it's properties and here is are two more examples. 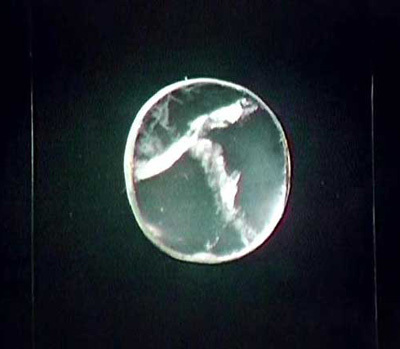 The first two examples show an optical lens made out of quartz crystal. This artifact is housed in the British Museum in London. It is also called the Nirud Lens. The lens was not found in MesoAmerica but in ancient Irak during the excavation of Niniveh and Babylon. The first two photos on the left show this lens. 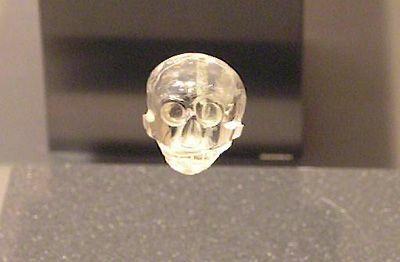 Like the smaller Crystal Skulls of Mexico above th Nimrud Lens is undisputed in archaeological circles. 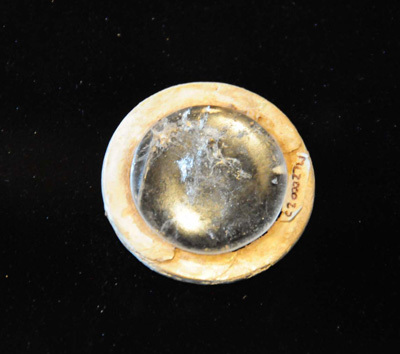 The Nimrud lens is known since te late 1800s and was always regarded as an oddity that shows the genius of the ancient people. As a side note I just want to mention that the lens was found in the same area as the famous ancient battery that is housed in the National Museum of Irak in Baghdad. 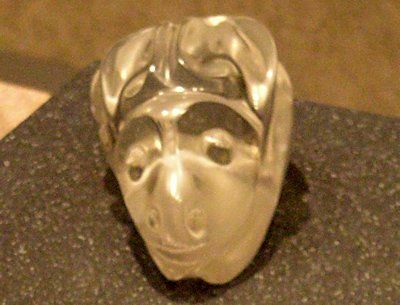 I'm pretty certain that here on paleoseti.com is the only place you can see the ancient Peruvian lenses on the internet. 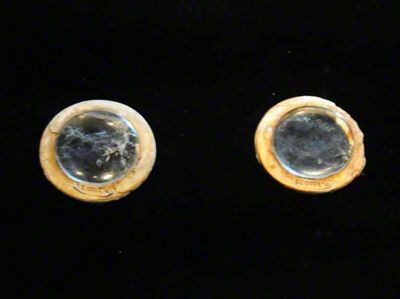 Above and below: The Nimrud lens in the British Museum, London. I find it absolutely amazing that no Google search on the Crystal skulls, no online enzyclopedia article (Wikipedia and Encyclopedia Britannica) brings up any of the above objects. They don't seem to exist, no matter if the article is written by "New Age enthusiasts" or the usual "debunkers" that think everything is fake that doesn't fit in the usual scheme. In this context it is extremely important to know that there is an unwritten rule among Archaeologists. If an object is not found during an official archaeological excavation, it is assumed to be not genuine. Only in very rare cases does official Archaeology acknowledge items that have not been found during excavations. The last item of significance that I'm aware of is acknowledged to be genuine was the "Sky Disk of Nebra" in Germany. But even in this case there are "pockets of resistance" among a few "hardliners" that will probably never acknowledge it to be genuine. The reason for that is simple. Grave robbers and black market antiquity dealers (a problem for Archaeology ever since the first Pyramids have been built) should be discouraged to dig up items and sell it for a lot of money. The fact that pretty much all of the big museums in the world - be it the Vatican Museum, British museum you name it - is full of items that where "collected" without the permission of the countries they were collected from doesn't really concern those same hardliners. But that's a different story. Back to the Crystal skulls. None of the aforementioned big skulls (British Museum, Paris, Mitchell-Hedges) where actually found and documented during official excavations. Therefore they where never accepted to be geniune. To me it is amazing and surprising that the skulls where examined over and over again up to the 1990s and not once any tool marks have been found. All over sudden it is stated that toolmarks can be seen an all the skulls rendering them fakes. Yes, there where technical advancements in the last ten years, but in the 1990s technology was advanced enough to detect tool marks, no problem. Electron microscopes were able to detect viruses and items on an atomic levels, but the tool marks on the skulls they missed. Very awkward. The most interesting piece of the puzzle to me is that the above mentioned quartz artifacts that I photographed in the various museums have been found during official excavations and nobody has ever disputed their authenticity. I'm also not aware that anybody had tested the any of the above artifacts for toolmarks. Wouldn't it be interesting for any scientist, not just archaeologists, to see if they exhibit the same toolmarks as they claim to have found on the big skulls? Are they afraid to find the same tool marks on those lesser known artifacts and they have to rewrite some of our ancient history? But this is not how the story ends. There is still the question of why Quartz was in such high regards among the anient peoples. What was so special about it. It's certainly true that Quartz looks fabulous because it's translucent, but I think we make it ourselves too easy by saying it was valued, because it's "pretty". Many of the ancient peoples all around the globe claimed that Quartz was the 'stone of the Gods', just like Gold was the 'metal of the Gods'. What makes Quartz and Gold so special? I'm convinced that this has something to do with the universal properties of both substances in electronics. In fact Quartz (and Gold) are the two components that make any type of modern electronic device work. Quartz literally makes everything "tick". The best example for this are Quartz watches. In a Quartz watch or clock, Quartz crystals are used to regulate electronic oscillators. WIth such a crystal oscillator, very precise frequencies can be created that make timepieces of stunning accuracy possible. Today we are used to cheap watches with Quartz movements, but when they first came out as wristwatches in the late 1960s, they were a sensation. Quartz oscillators were in use from the 1930s on. In fact during the second world war most of the Quartz used in modern applications came from South America. Modern computer technology wouldn't be possible without Quartz or Gold. For critical high end electronic applications gold is still the best material as it is an excellent conductor. Quartz crystals are in pretty much every modern computing device as they provide the internal 'heart beat' for the processors. Does history repeat itself? Was Quartz so special to the ancients because the 'gods' needed it for their applications? Is that the reason the ancient people regarded it so highly although those 'gods' already left? In this article I wanted to show you that there is much more to the story of the Crystal skulls than meets the eye. Since I have never seen any of the big skulls for myself, I can't decide if they are geniune, old artifacts or not. 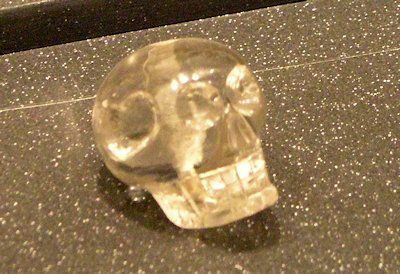 The Crystal artifacts that I have seen are real and it seems to me that a lot more research is needed to determine if the big skulls are ancient or not. This needs to be done by comparing the above items with the skulls in question. I think the only way to do this is to send ALL the Crystal Quartz artifacts to an independent lab that is not biased to one opinion or the other.